Imagine that the first time you ever saw tennis, you were so far away, you couldn't see the ball. No matter how long you spent watching, you'd be hard-pressed to arrive at any conclusion other than "these people are crazy". In fact you'd be a damned fool to think anything else. Only by seeing the game up close could you observe that all the running and whacking had a purpose; then you still might think "these people are crazy" but at least you could understand what they were trying to do. I got thinking about this back in May when Ron Paul stunned the Republican debate with his view that 9/11 was the result of what the CIA calls "blowback"; that somehow American foreign policy had angered people. In the midst of explicating his position, Dr. Paul twice quoted Ronald Reagan as saying "We don't understand the irrationality of Middle Eastern politics." BAGHDAD, July 20 (UPI) -- Iraq's unions say the draft oil law is a threat and threaten "mutiny" if Parliament approves the bill. "This law cancels the great achievements of the Iraq people," Subhi al-Badri, head of the Iraqi Federation of Union Councils, told the al-Sharqiyah TV station. He referred specifically to laws that nationalized Iraq's oil sector. Iraq holds 115 billion barrels of proven reserves, the third largest in the world, and likely much more when the country is fully explored. It could produce more than the 2 million barrels per day, and many are pushing the oil law as a means of solidifying investment in the sector. The law, as drafted, allows for foreign access to the oil, a line that must not be crossed, the oil unions say. They have threatened to strike in the past -- and made good on the threat as recently as last month -- and claim workers of all sectors support them. That was verified by Badri's interview, as reported by the Middle East Economic Survey. "If the Iraqi Parliament approves this law, we will resort to mutiny," he said. "This law is a bomb that may kill everyone. Iraqi oil does not belong to any certain side. It belongs to all future generations." The law is stuck in negotiations with various parties demanding either a strong regional/local control over the oil sector vs. a strong federal government control. You could read this "news" piece a thousand times and you would never know why the Iraqi unions were ready to "mutiny", unless of course they happened to be irrational. Foreign access to the oil? Is that really a line that must not be crossed? Foreigners are going to buy that oil anyway, aren't they? Doesn't that count as access? These people are so irrational! And imagine fighting over regional vs. federal control of natural resources in terms like "This law is a bomb that may kill everyone"! How irrational can you get? In my view, in relation to Middle Eastern politics, we qualify as an observer who can't see the tennis ball. We don't understand the languages, we don't understand the cultures, we don't know who the players are nor what their motivations might happen to be. So of course the game appears entirely irrational. And we comfort ourselves by thinking the most bizarre thoughts about people and situations we don't understand at all. If they're all irrational, then they're not like us, are they? So there's no need for us to be concerned about what happens to them, as you can see for yourself in the tone of the piece quoted above, one of a million similar mainstream "news" items -- all lying. They lie by hiding the ball. Leaving out a bit of context here and there makes all the difference. Iraq holds 115 billion barrels of proven reserves; light sweet crude which can be had for just a few bucks apiece and sold for at least $70. There's no place on Earth where an oil company can make more money faster. The law, as drafted, puts control of Iraq's oil in the hands of foreigners, and that's the line the unions say must not be crossed. The "regional/local vs. federal" issue is a distraction, and it's intended as such. 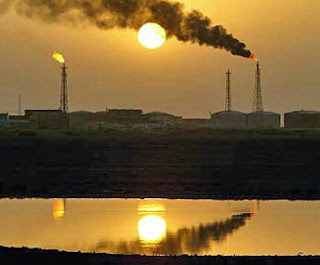 The oil law as drafted allocates seven eighths of the revenue to a consortium of foreign-controlled companies and leaves just one eighth for Iraq. The Iraqi parliament is supposedly squabbling over who controls the revenue, but in fact there's nothing left to fight over but one slice among eight. And for this reason, Iraqis find the law so objectionable that even the puppets in their parliament -- installed in the "democratic election" run by the occupying foreigners -- are refusing to pass it. And the nation's workers, by striking, then threatening to mutiny, are supporting the best instincts of their "elected representatives" -- and threatening them at the same time! It's an entirely rational thing to do, in my opinion, especially when the future of the country's vast natural wealth is at stake. What's irrational is believing that people -- whole cultures! -- are irrational, when we don't know the first thing about them. We support the Iraqi people's sovereign right to the country's oil. We reject the pressure campaign led by the Bush Administration and multi-national oil companies to force Iraqis to adopt this draft Oil Law, which risks conceding extraordinary rights over revenue and production to foreign corporations. Iraq's oil wealth should be shared fairly among all Iraqis to help them rebuild their country. We affirm the right and responsibility of Iraq's national parliament to take the final decisions on this matter, and call on the US President and Congress to respect Iraq's sovereignty. We stand in solidarity with Iraqi leaders who oppose this unwarranted foreign interference. If we can't get the war stopped, then the least we can do is sign a petition here and there.